After a difficult challenge for the month of March, the month of April brings yet another difficult challenge for you. We have to wisely and creatively use our white cells to concoct a preparation which involves fusion of two cuisines or two regions, which tastes interesting. One can easily say it’s East meets the West or the North meets South, for example, the paav-bhaaji meets the dosa or the paneer-tikka meets the Pizza. Priya Mahadevan of Now Serving is going to host the event for April and the rules and details of the event can be checked from her space later in the day today, once she announces it. Wish you all the luck Priya. We will have only ONE GIVEAWAY for this month and that will be from www.tarladalal.com. They have offered to give a book called 7 Dinner Menus. 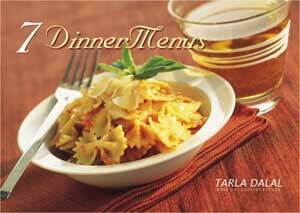 This book offers 7 dinner menus from across the world and is surely a treat for everyone who wants to add more variety to their regular dinner. This giveaway is only for INDIAN participants and you NEED NOT leave any links here. Priya will pick up the winner after the completion of event. I am also looking out for bloggers who would be interested in hosting the ‘ONLY’ Event in future. One can check up the host line up in the menu below the blog header for further details and mail me to cookingoodfood@gmail.com. Lovely round up. I am sure going to participate. This event sounds interesting I sure am going to participate. Nice event !! would love to participate !! This is very interesting event.I am first here in your place.You have very nice collection of recipes.I am happy to follow you. Wonderful event...Would love to participate!! just linked an entry for yours and Priya's fusion event.